Union Public Service Commission (UPSC) has published a Recruitment Notification (08/2016) on 10/04/2016. The notification is for the recruitment of the Combined Medical Services (CMS) examination 2019. Here you will find complete information about the UPSC Combined Medical Services (CMS) Exam 2019 Recruitment Online Application Form 2019. You will get full information about UPSC joint medical service here. 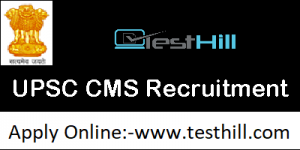 CMS) Examination 2019 Application Process, Important Dates, Application Fee, Age Limit, Eligibility, Number of Vacancies, Pay Scales and Important Links If you have any doubts about the UPSC Combined Medical Service (CMS) Examination 2019 Recruitment Online Application Process, you can ask us through the comment form below. Candidates can apply for the CMS 2019-20 examination through the official website. In all, the application process will have two stages – the first step and the second step. In Step I, candidates are required to register and enter details such as educational details address information, and personal information. After going into the second phase with this stage, according to which the candidates have to select the examination center of their choice, pay the application fee, upload the scanned images and more. All aspirants can fetch the important data regarding the UPSC CMS Online Form 2019 to official website defined in the above information else, they can check our website for the same www.testhill.com. As we have updated all the vital information regarding the declared UPSC Official Notification 2019. You can find all the important links which redirect you to the official page of the department’s official website. You can apply for the UPSC CMS Online Form 2019 just by a single click. The online portal to apply for the UPSC CDS Recruitment will be open from 10th April 2019 to 06th May 2019. If you are interested and going to apply for this, you have to know about all the important dates. All important dates related to UPSC Online Form are given below. The candidate should pass the written and practical parts of the final M.B.B. examination, which will be eligible for this recruitment.